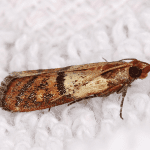 Remove Moths From Pantry in Suffolk County | EcoTech Pest Control Inc. GRAIN MOTHS are tiny beige moths that just FLUTTER around the house, and appear to have just popped up out of nowhere. In all actuality, they come into the house as larvae in pasta or grain products. The larvae get into the products in the factories where it is milled, feeding on the product in the package for weeks as it is shipped to the stores, stocked and placed on the shelves and finally, eventually being purchased and brought into your home. By the time the product gets into your home they are often ready to pupate. Tiny waxy yellow “inchworms” slink out of the packaging, crawl up the walls of your kitchen or pantry, and then follow the crease of where the ceiling meets the wall. They will often go undetected as they all head out of the grain product at the same time to pupate. They will climb the wall immediately upon leaving the package and spread out as soon as they reach the ceiling. The entire process may be over in minutes, while nobody is even in the room to see it. After they’ve spread out along the corner of the walls & ceiling, they will spin small, thin cocoons around themselves, which are hardly noticeable if you aren’t looking for them. Within a couple of days they will emerge as adult grain moths. When these moths are sitting, their wings will lay flat, and narrow on their backs. Their shape when sitting is similar to a tiny paper airplane. Once an infestation has begun, it becomes very difficult to get rid of the GRAIN MOTHS if you don’t act quickly and follow specific instructions from a knowledgeable pest control technician. A TRAINED ECOTECH PROFESSIONAL WILL KNOW EXACTLY WHAT NEEDS TO BE DONE TO ELIMINATE THE GRAIN MOTHS WITHOUT HAVING TO THROW AWAY HUNDREDS OF DOLLARS OF GROCERIES, AND WITHOUT EXPOSING YOUR FAMILY TO ANY HARMFUL CHEMICALS. CALL US TODAY (631) 887-3028 or (516) 226-0988 FOR YOUR FREE INSPECTION.